Retox Sessions & AG Productions is proud to present one of the emerging names in Dance Music. Rocco Rampino also known as Congorock, burst into the scene with 2 years ago, and in that short time he has been touted as the next big thing from the biggest Artists in dance music. His tracks have been a staple on everyone’s playlist from From Afrojack To Tiesto. On the dj front he has graced some of the most prestigious vents such as ultra music festival & Coachella. 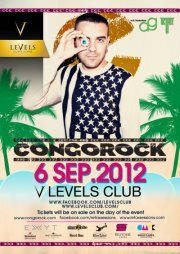 Don’t miss out on what’s to be another crazy night with Congorock! Joining Congorock for the night be Bangkoks’ favorites Superzaaap warming up the night early on. Tickets will be available at the door for 750 baht and includes an open bar from 9.30-10.30pm. Any entrance after the open bar period will receive on complimentary drink.